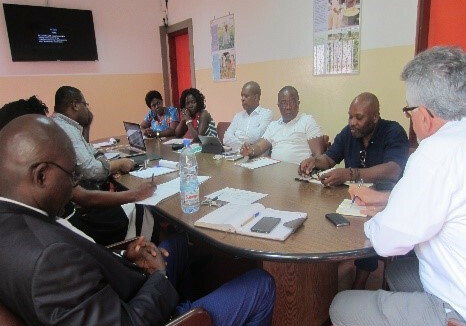 Participants met at the IITA Board Room in Cameroon. Fotso Apollin from IITA Cameroon, who is also the PIDMA focal point, made a brief presentation on the seven different cassava genotypes developed so far in the Institute. He emphasized the quality of cassava varieties, adding that it could be measured in terms of resistance to pests and diseases and the nutrient content. Singling out the biofortified pro-vitamin A yellow cassava, he emphasized the importance of carotenoid content, although the carotenoid content on cassava varieties depend on the variety. Some African countries such as Cameroon, DR Congo, Malawi, Nigeria, and Tanzania have adopted its production not only because of its acceptable taste but also because it can be used for multipurpose production of foods. Albert Ndjee, Chief Executive Officer of Neilly’s Foods Limited, a potential partner from the United States, gave a presentation about the activities and capacity of his company and how they can partner in the cassava value chain within PIDMA. Neilly’s Foods specializes in large-scale distribution of food products. Ndjee said the company has plans to evaluate and carry out ingredient analysis on local cassava varieties to obtain food products based on the varieties’ characteristics for productivity, cooking, and nutritional value. To reassure the business partners, a small workshop was organized in which they had the opportunity to see, taste, and evaluate the different parameters highlighted for the different cassava varieties, especially their cooking quality, taste and “mealiness.” At the end of the workshop the entrepreneurs expressed satisfaction with ongoing research on cassava at IITA, which so far has not only gained it an outstanding position in the market but has also helped in attracting foreign entrepreneurs.